At the Consumer Electronics Show this year, BMW Motorrad showcased an innovation they call ConnectRide. BMW's CES 2016 exhibit is a company-modified BMW K1600 GTL fitted with the two technologies that comprise the ConnectRide concept  laser headlights and controls for a helmet-integrated head-up display. The laser headlight technology, which is used in the BMW i8 and the BMW 7 Series, has now been adapted for motorcycle applications. BMW says that with this technology, they can "achieve a high-beam range of up to 600 metres, which is double that of conventional headlights." They further state that laser headlights are more reliable with "a very long service life, thanks to their compact, robust and maintenance-free construction." However, it could be a while before the laser light technology for motorcycles hits production, as it is still in its preliminary stages of development. The head-up display unit can be integrated into existing helmets, and shows all the necessary information such as traffic conditions, speed limit and road sign recognition. It can also provide real-time information on the vehicle such as tyre pressure, oil/fuel level, travel speed and selected gear. The information to be displayed on the screen can be controlled from the left-hand handlebar fittings using the BMW Motorrad multicontroller. Munich. BMW Motorrad will be displaying two innovations at the Consumer Electronics Show (CES) in Las Vegas on 6-9 January 2016. Laser light for motorcycles and a helmet with a head-up display will be presented, setting new standards of motorcycle safety, along with a technical outlook of how they may be employed in series models of the future. BMW K 1600 GTL concept vehicle with BMW Motorrad laser light. See and be seen has always been one of the central axioms of safe motorcycling, for which reason BMW Motorrad has long since dedicated itself to the continued development and optimisation of motorcycle lighting units. Over the years, this has seen the introduction of adaptive headlights for riding in curves, LED daytime running light and dynamic brake light in BMW motorcycles. And like so often, the development was able to benefit from synergy effects with BMW automobiles. In the case of the K 1600 GTL concept vehicle presented here, the BMW Motorrad laser light is derived from a design from the automobile division of the BMW Group. The innovative laser technology is already available in the new BMW 7 Series as well as in the BMW i8. BMW Motorrad has now adapted this technology  which is as established as it is forward-looking  for motorcycling applications. Not only do laser light headlamps generate a particularly bright and pure-white light, but they even achieve a high-beam range of up to 600 metres, which is double that of conventional headlights. The safety of night-time riding has now increased significantly as a result, due not only to the increased range but also to the precise illumination of the road. Moreover, the laser technology has a very long service life, thanks to its compact, robust and maintenance-free construction. 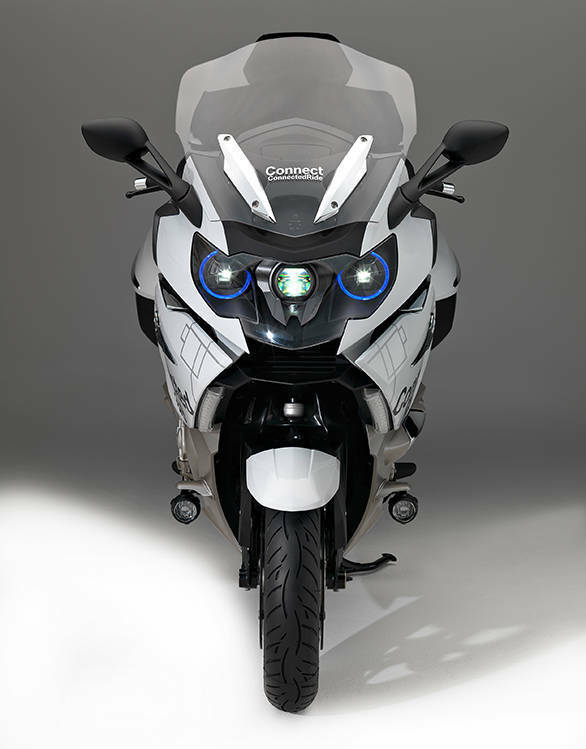 BMW Motorrad laser light has been incorporated in the K 1600 GTL concept vehicle as a feasibility test. BMW Motorrad is testing the use of this headlamp technology in series vehicles in the course of its preliminary development. At the moment, the technology is still too cost-intensive for use in motorcycles. However, it is expected that the economies of scale resulting from their large-scale use in the automobile industry will result in a price structure with a clear downward trend. Its use in motorcycles could might then be imaginable in the medium term. 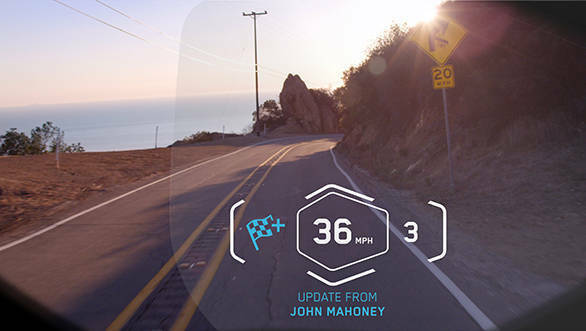 Head-up display helmet: road information always in your sights. In road traffic, it only takes a fraction of a second or a brief distraction to put the rider in a dangerous situation. In 2003, BMW became the first European automobile manufacturer to introduce a head-up display as optional equipment for BMW automobiles. The BMW head-up display projects necessary or desirable traffic or vehicle information directly into the rider's field of view, allowing him to maintain constant observation of the traffic on the road, with no distraction. This would appear even more important with motorcycles than it is with cars, because it can sometimes only take a brief visual distraction to put the rider in a critical road situation. 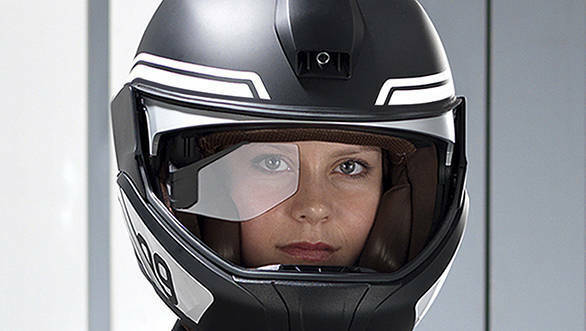 With a view to offering this technology in motorcycles of the future, a pre-development process was conducted in which a BMW Motorrad helmet was fitted with an innovative head-up display function. This enables the projection of data directly into the rider's field of view. This means that the rider no longer has to glance at the instrument panel and he is able to concentrate fully and without distraction on the road traffic. All displays are freely programmable; ideally, to provide the best-possible support for rider safety, only information that is helpful and relevant to the current situation should be displayed to the rider at any given moment. Safety and comfort information for an even more emotionally charged riding experience. The display options comprise safety-relevant information, for instance data relating to the technical status of the motorcycle, such as tyre pressure, oil level and fuel level, travel speed and selected gear, speed limit and road sign recognition, plus warnings of impending dangers. By means of the future V2V (vehicle-to-vehicle) communication, it might also be possible to display information in real time, for example to give due warning of any suddenly impending hazards. Moreover, the head-up display also allows the visualisation of content designed to increase rider comfort. An example would be the planned route along with navigation advice prior to commencing a journey. The helmet with head-up display also offers interesting possibilities for making the highly emotional experience of motorcycle riding even more intensive and at the same time safer. For instance, an action camera pointing forwards, located inside the helmet, can record video footage of the journey directly from the helmet. A second camera oriented towards the rear could at some point in the future perform the function of a 'digital rear-view mirror'. And last but not least, this technology also enables the visualisation of other riders in a motorcycle group. This enables the rider to see where his companions are at any given moment. The helmet, which is also fitted with an integrated mini-computer and loudspeakers, is controlled from the left-hand handlebar fittings using the BMW Motorrad multicontroller. As well as operating the camera, this allows the rider to comfortably select the information he requires. The necessary information display technology can be integrated in existing helmets, without affecting either wearer comfort or rider safety. The operating time of the system with the two replaceable batteries is around five hours. BMW Motorrad wants to develop this innovative technology to series-production level within the next few years, thus adding a further safety feature to its already wide range of rider equipment.